The Core Balance Diet was developed by Marcelle Pick, who is co-founder of Women to Women—one of the first clinics in the United States devoted to providing healthcare for women by women. In creating this plan, Pick has drawn on her extensive experience and that of her patients in order to solve the mystery of stubborn weight gain. Her aim is to reassure women that it is not their fault when standard methods of dieting do not produce results. It is because something is out of balance. She explains that when your physiology and metabolism becomes imbalanced your body tries to protect itself by adding stubborn fat, which she calls ‘toxic weight’. The only way to solve this problem is to bring your body back into Core Balance, which heals the metabolism and allows you to lose the weight for good. Pick outlines the six common biochemical imbalances – digestive, hormonal, adrenal, neurotransmitter, inflammation, and detoxification – and explains each one in detail. The book also includes quizzes that will help you to determine which one is affecting you the most. The first two weeks of the program involve a detox period where you learn how to change your diet and lifestyle in order to become more in touch with your body and identify your major obstacles to weight loss. In the second two weeks you undertake a customized program, depending on which key area you identified. This will enable you to restore your Core Balance so that you will be able to rid yourself of ‘toxic weight’. The diet component involves eating frequent meals that are based on whole foods that will give your body the nutritional support it needs to restore metabolic balance. It entails eating a balance of approximately 30% fat, 30% protein and 40% carbohydrates with an eating pattern that is very similar to the Zone Diet. However, rather than focusing on strict ratios, the Core Balance Diet plan is more concentrated on the quality of the foods you choose, with a strong emphasis on healthy fats such as omega 3 and monounsaturated fatty acids, lean proteins, phytonutrient-rich vegetables and fruits, and complex carbohydrates. A key element of this program involves addressing emotional issues and behavioral patterns that may be blocking you from making positive lifestyle changes. Fresh fruit and vegetables, chicken breast, turkey, salmon, eggs, legumes, whole grains, raw nuts and seeds, olive oil. The recommended diet plan varies depending on which imbalance you identify as affecting you the most. The following is an example of the Digestive Imbalance plan. Pick highlights the importance of exercise because it improves insulin sensitivity has the capacity to reduce abdominal fat, even without dieting. However she advises dieters to make exercise fun and something that you look forward to, and above all not to allow your exercise routine (or lack of one), to become a source of stress in your life. One of the major benefits of exercise is that it helps to relieve stress, not produce it. 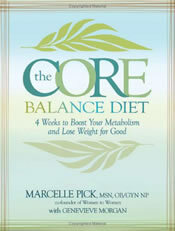 The Core Balance Diet: 4 Weeks to Boost Your Metabolism and Lose Weight for Good retails at $25.95. Concentrates on supporting health first, with weight loss as a long-term outcome. Encourages the intake of fresh fruits and vegetables. May reduce the risk of developing diabetes, cancer and arthritis. Appeals to dieters who have tried conventional diets without success. Addresses the importance of emotional factors in weight problems. May involve the need for nutritional supplements or diagnostic tests. The Core Balance Diet will most appeal to women who have tried conventional weight loss methods without achieving success. It’s strength lies in the customized plan that is adapted in accordance with your individual health profile. Pick, M. (2009). The core balance diet: 4 weeks to boost your metabolism and lose weight for good. Hay House, Inc.